"A few years ago, [during] my trip to Hanoi, I had an occasion to view Dinh Quan's paintings in his joint exhibition with other painters of the group such as Quoc Hoi, Pham Ngoc Minh, Quang Huy and Tran Quoc Tuan... The view of Dinh Quan's new paintings gives the feeling that we are in closer contact with the author himself because they are simple, free from preciousness and they are not trying to daggle our eyes with technicalities. "Quan is more and more the master of lacquer painting and gets more effective command of its technique, which accordingly gives him enough freedom and power in his artistic creativity." It wasn’t just anyone who stated the words above. The highly influential and respected Vietnamese artist Nguyen Trung, wrote these words from Ho Chi Minh City on September 24, 1994, who recognised in the young Dinh Quan's still-emerging "mastery", a changing of the guard. In picking out Dinh Quan and several of his contemporaries, Nguyen Trung was identifying a shift in the stance of Vietnamese art with the coming of a new generation too young to have been active professional artists at the time of the Resistance War Against America. It is a shift that has continued its steady progress since then, with the local art scene gaining ever-greater professionalism as its practitioners have switched their gaze towards new fields such as installation art, performance art and video art. Benefiting from the flourishing cultural and travel opportunities of the 1990s, 2000s and 2010s, the Vietnamese artists of recent decades have adopted a more world-oriented perspective on their art than many of their forebears could have ever imagined. Dinh Quan is not only one of his country's pre-eminent lacquer artists, but has even been described by one gallery as the "irreplaceable face of Vietnam lacquer art". What lies behind such a "legend" - and one of Vietnam’s most innovative lacquer painters? Well, in common with so many other great artists, a certain restless experimentation has something to do with it. Dinh Quan won widespread admiration for his use of complex techniques in his depiction of the gender that he is proud to "honour... from the love, despair and doubt that they impart in me." He is, of course, talking about women, although the artist's celebrations of them are far from just the refined, Surrealist portrayals that they may initially seem from the computer screen. There is a definite ethereal quality to Dinh Quan's work imparted to it by his especially well-practised and intelligent use of lacquer, routinely incorporating multiple layers. All the while, he has been proud to allow the influences of his homeland and Buddhist beliefs to be felt in such pieces that really do transport the viewer to a separate, mystical world. It should hardly be a surprise, then, that Dinh Quan has gained such fabled status in his home country. His sheer artistic prowess and determination have also powered him to no shortage of major career achievements and accolades since his 1964 birth in Hai Phong in the north of Vietnam. Since his graduation in 1990 from the Hanoi University of Fine Arts, where he specialised in lacquer ware, Dinh Quan has appeared regularly in group shows such as the National Fine Art Exhibitions and Capital Fine Arts Exhibitions in Hanoi, as well as in China, Japan, France, England, Singapore, the Philippines, Italy, Belgium, Malaysia and the USA. As if all of those feats weren't enough, Dinh Quan has also exhibited solo at the likes of Trang An Gallery in Hanoi, Gajah Gallery in Singapore and Thavibu Gallery in Thailand. 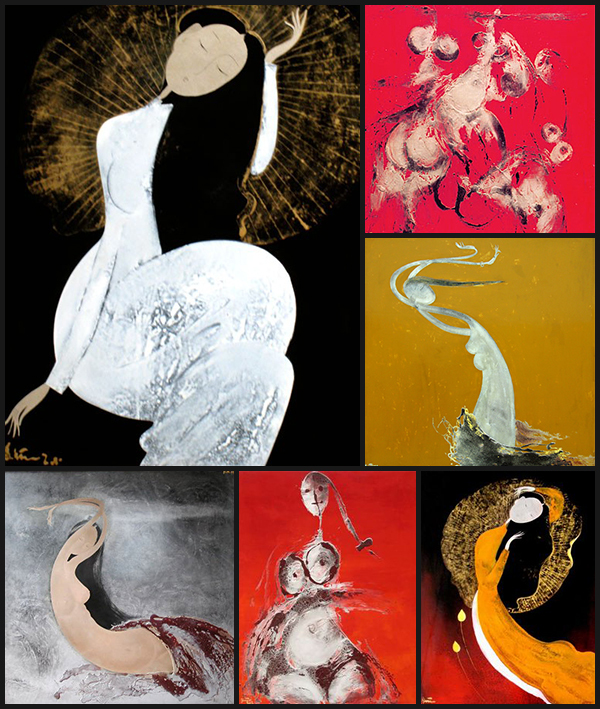 He has won multiple awards in his own country, has pieces in the public collections of the Singapore Art Museum and Vietnam Fine Art Museum and, as a member of the Vietnam Fine Arts Association, helps to pass on his formidable skills and knowledge to the next generation of Vietnamese artists. It has already been quite the career for Dinh Quan - more than backing up the hopes that Nguyen Trung and many other older regional artists would have had for him back in the early 1990s - and his story is far from over!